While cruising the official Android website, one of our readers happened upon what looks to be an early slip up, or complete mistake, from Google itself. When describing the options available when purchasing the Nexus 5 on Google Play, Google states that the device comes in four colors; Black, White, Red, and Yellow. However, as you may all know, the Nexus 5 is not available in a Yellow variant. 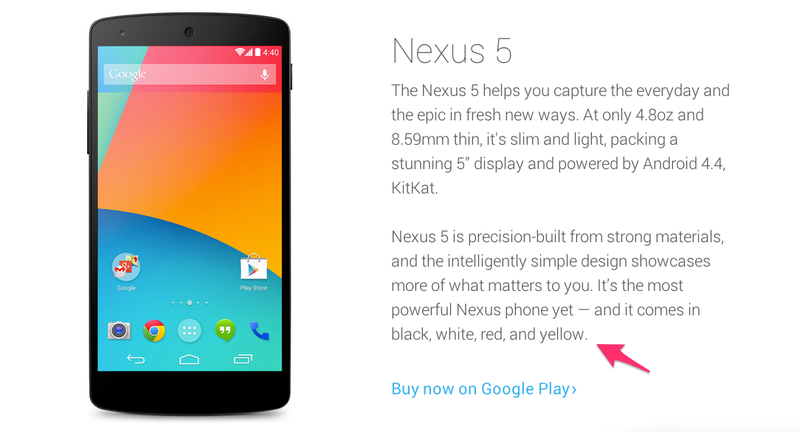 Did Google simply slip up, or should we expect a Yellow Nexus 5 to hit Google Play at anytime? While the introduction of a new color for the Nexus 5 wouldn’t disappoint us, it seems rather late in the device’s life to be still pumping out new colors. We shall see. If the Nexus 5 does get announced in a Yellow colorway, would you pick up a Bumblebee model?